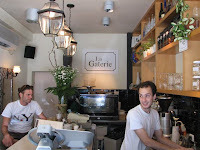 Address: 184 Ben Yehuda st, 97 King George st.
La Gaterie ("the little treat" in French) is an unique concept of a francophile eatery. Their main dish is a home made croissant filled with a variety of cheeses, superb cold cuts and poached egg - combined as you wish. It's not really filling but absolutely delicious, so it's a good place to go when you feel moody or want to spoil yourself on your last day in Tel Aviv. Ben Yehuda is parallel to Dizengoff from the Dizengoff Square on (facing north). After you pass the square turn left to reach Ben Yehuda, take right and then go straight until you get there. To the King George branch - located at the north part, next to the intersection with Zamenhoff st.